Imitation is the sincerest form of Flattery. That why Michelle Obama, George Soros and the SEIU are now operating a fake BlackPAC. Turning Point USA Candice Owens and Charlie Kirk also have a fake BlakPAC called Blexit. It's like Little Richard, We are the Originator of this Soul Train. She is trying to deceive and mislead Blacks much like the Obama Presidency deceived the Nation. The Hope and Change brought by them decimated the Black community and we will not let that happen again. We had the highest unemployment in history under President Obama and now have the lowest ever under President Trump This woman destroyed school lunches while her husband created the school to prison pipeline in Black communities. Now she is trying to destroy the real BlakPAC by representing a fake one. Blacks are too smart to return to the failed policies of the Obama administration. The lies, deceit and the cheating, plus the destruction of Haiti by the Clinton Foundation are fresh in their minds. Fake groups led by Michele Obama and George Soros will not work. They can never be as effective as the real BlakPAC. How does BlakPAC do it. First, we have the largest number of Minority GOP Nominees for the Mid Terms and this is leading to the largest number of minority voters. Second, we are engaging the large number of No Party Affiliated and low propensity voters that both Parties ignore and third, we work harder and smarter. BlakPac does not have to lie and cheat like the Democrats. BlakPac launched a new and improved website with increased emphasis on direct digital communication. 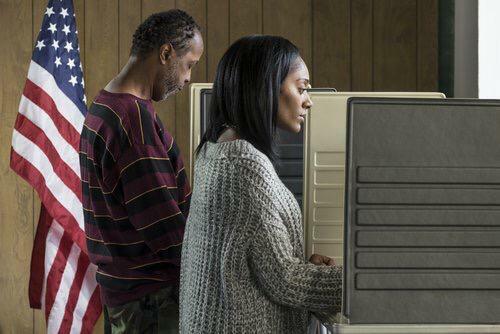 BlakPac is proud to announce the strongest and largest class of GOP Black Congressional Nominees since 1875. We said it before, our top priority is making sure Republicans maintain a majority in Congress for the 2018 Midterm elections and the best way to do that is by electing #MAGA candidates that will support President Trump's Agenda. Our Second Priority is making sure we elect Qualified American Patriots of Diverse Backgrounds to Congress during the 2018 Midterms. We pray that President Trump agrees and will reciprocate and support our Battle tested American Warriors. Aja Smith is the Republican Nominee for United States Congress in the 41st District. Sgt. Aja Smith (Vet) has dedicated her career to serving her country. In 2007, she was deployed to Qatar and stationed at Al-Udeid Air Force Base during Operation Enduring Freedom. Aja Smith will be a solid supporter of Veterans and work to create more job training and business development for her constituents. John James is the Republican Nominee for the United States Senate from Michigan. At 17, John made the decision to serve his country. After graduating from West Point in 2004, he became a Ranger-qualified aviation officer. John went on to serve with distinction in Operation Iraqi Freedom where he earned a Combat Action Badge (CAB) and two Air Medals, among other awards, while logging 753.8 flight hours in theater leading two Apache platoons. In addition to his Bachelor of Science from the U.S. Military Academy at West Point, John has earned a Master of Supply Chain Management and Information Systems from Penn State University and a Masters of Business Administration (MBA) from the University of Michigan. John is also a Lean Six Sigma He will begin work in the Senate to develop strategies to address our national debt, improve our cyber defenses, and give our military the resources that they need to keep Americans safe. Willie Billups is the Republican Nominee in the 33rd District of Texas. Willie is a Service-Disabled Veteran, Willie Billups retired after 20-years of active duty with the Army and Marine Corps. In the Marine Corps, Willie specialized in Aviation/Aircraft Maintenance. After 12-years of active duty, he switched to the Army, where he served as a pilot on both helicopters and airplanes. In 2015, Willie retired from Fort Hood, TX as a pilot at 15th Military Intelligence Battalion, Intelligence and National Security Command (INSCOM). Jeff Dove served in Operation Iraqi Freedom, where he worked as a 74D Chemical Operations Specialist, and was awarded the Combat Action Badge. The Army was Jeff Dove's finishing school. It gave him discipline, a sense of accomplishment, and turned him into a self-starter when it came to any task at hand. After his Military service, he enrolled in Strayer University, where he made the Dean’s Honor Roll while working full time. He holds a Bachelor’s Degree in Information Systems. Veteran Jeff Dove’s experiences helped shape his conservative principles – a foundation of beliefs that support free markets, personal liberty, respect for the Constitution, and traditional values. He knows it’s important that this vision be gained through the clear lens of American values. With your financial support, we can support battle tested American Patriots like these #MAGA Candidates that will support the President Trump Agenda. President Trump and BlakPAC are all over the country supporting Conservatives ready to fight the obstruction in Washington, DC. Together, we can elect House and Senate candidates that will stand for the America First agenda. In 1875, there were seven Black Republicans serving in the United States Congress which consisted of 37 states. Help us restore that Rich American History of cooperation and freedom by doing all we can to elect these five Patriots along with Rep. Will Hurd and Rep. Mia Love. Then on Tuesday, November 6, 2018, we can all proudly proclaim that we have MADE AMERICA GREAT AGAIN! Please click through and donate directly to the GOP Nominee of your choice or donate directly to BlakPAC. Every dollar you can give is sincerely appreciated. On March 17, 2016, The Black, Latin and Asian Political Action Committee, known as BlakPac, endorsed candidate Donald Trump and issued a game changing endorsement because we believed electing President Trump would save America. We were right! President Trump is making America great again. He is not racist despite the Main Stream Media efforts to label him one. He is bringing jobs back to the USA and as a result, we have the lowest Black unemployment rate in history. Thanks to our hard work, BlakPac and our coalition members earned an invitation to the White House to attend the National African American History Reception with President Donald and First Lady Melania Trump. We had the pleasure to meet Surgeon General Jerome Adams, Treasury Secretary Steven Mnuchin and HUD Secretary Ben Carson. When we were in the White House with 600 other National Leaders including Alveda King, Sheriff David A Clarke, Herman Cain, Katrina Pierson, Dr. Carol Swain, Ward Connerly, Pastor Darrell Scott and Pastor Mark Barnes, we realized how far we have come since those early days when BlakPac was among the first groups to issue a written endorsement and actively campaign for Candidate Trump We often felt so alone supporting President Trump and working with limited resources against Crooked Hillary. We now have the incredible opportunity to elect more people to lead the charge to a Colorblind America based upon character and not color. As we took in the grandeur of the White House, we realized that God did not bring us this far to fail, We now know that we are not alone but by combining our resources with other National leaders, we can double minority turnout for Republicans if we start early, work harder and back true conservatives. We constantly interact with minority communities nationwide to elect candidates regardless of color who are committed to live Colorblind. BlakPac brings conservative values to minority communities and we must keep boots on the ground in challenging neighborhoods. The Council of Economic Advisors estimates that these tax cuts will grow the economy an additional 3 percent. Businesses will be able to deduct 100 percent of the cost of their capital investments for the next five years.